Kitchen Window: The Hard-Boiled Truth About Egg Soups When T. Susan Chang was young, her mother would make egg soup for her when she got sick. Now, the food writer poaches a few eggs from her chickens' nests to make these soups when her kids get the sniffles. 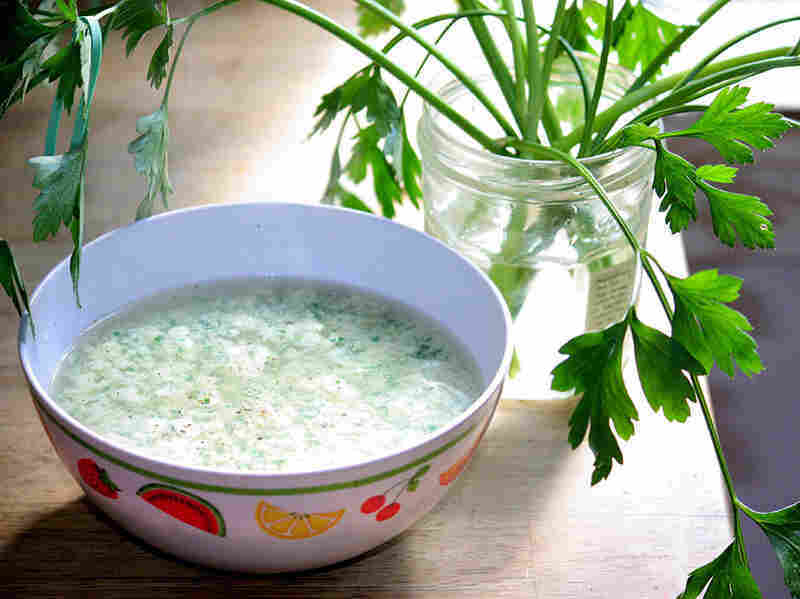 Get recipes for Stracciatella, Not My Mother's Egg Drop Soup and Double Lemon Avgolemono Soup. The chicks arrived five months ago — eight gray, blond, black and tawny puffballs no bigger than the eggs they'd been hatched from a day earlier. They had a slavishly devoted audience within minutes and names within 24 hours. Every couple of weeks they doubled in size, and over the summer they ballooned from 2 ounces to 7 pounds as we furiously worked to complete their permanent coop. 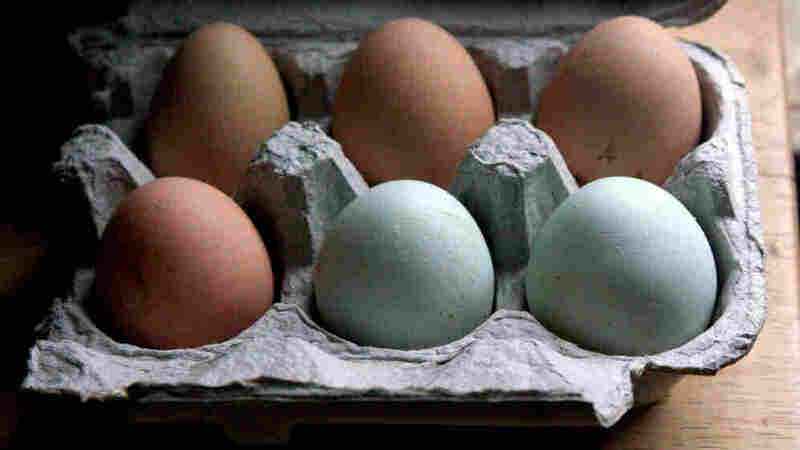 Every so often, someone would ask us: "What are you going to do with all those eggs?" Eight hens each laying about five days out of seven equals some 40 eggs a week when they're at their busiest, and not molting or sick or too old or too cold to lay. It might sound like a lot for just four people, but we're a family of egg eaters. We all eat eggs for breakfast, and we each have a different favorite: scrambled, poached, steamed or spicy/tomato-y. We regularly make desserts with eggs. We even eat eggs (occasionally egg salad) for lunch. When we're sick, it's always egg soup. I don't know why I always make egg soup when the kids are home with the sniffles. I suppose it's because it's easy to make with whatever's around the house on a day when I didn't expect to be making somebody else lunch. The steamy broth feels good in stuffy sinuses and noses, and the protein from the egg gives you a little energy when you haven't got much to spare. And you can make it when there's no leftover chicken on hand for chicken soup. My mom used to make egg soup for me, too, when I was sick, but hers was absolutely basic: eggs, scrambled and mixed with a can of chicken broth. As I recall, the whites had a way of adhering gloppily together in a way I'd have found hard to take when I didn't have the invalid's open-minded attitude about soup. When I got round to making egg soup for my own kids, I had strong ideas. I felt it should be full of things that taste good even when you aren't sick, such as shiitake mushrooms and caramelized shallots. The first time I made it, I happened to have some stock left over from steaming some chicken with Shaoxing wine and honey the previous night. The final soup was so good that the wine and honey became part of the recipe, as did fish sauce and slivered wonton skins. The steamy broth feels good in stuffy sinuses and noses and the protein from the egg gives you a little energy when you haven't got much to spare. And you can make it when there's no leftover chicken on hand for chicken soup. Of course, the vaguely Southeast Asian-inflected soup that is our house standard is only one among the world's many lovable egg soups. I have a particular weakness for the Mediterranean ones, such as the Greek avgolemono with its tart-yet-soothing melange of lemon, egg, rice and parsley. And while stracciatella (that's "shredded," in Italian), Roman egg drop soup, may be a whole lot thicker than its Eastern cousins — what with the Parmesan and the greens and sometimes even semolina flour — it's still a comfort and a joy on those chilly fall days. It was one such day in October when my Barred Rock, One Patch, at last produced her first egg. I stood outside the coop peeking in, wet leaves saturating my ankles and a cold breeze finding its way down my neck as One Patch glacially, stoically went about her business. "I'll probably catch a whopper of a cold," I thought to myself. But when she finally rose from her nest, I went round to the egg door to find the first of her treasure, speckled, brown and warm, and I knew I held an antidote worth any host of ills. Note: I've scaled these recipes down to one generous bowlful, because they really do make splendid single servings for a soul-boosting lunch at home, or for a sick loved one. But if you'd like to serve more, simply scale up proportionally. There are perhaps as many versions of this soup as there are cooks. Some have spinach or chard; some hold the semolina. I like this one because it's got a bit of body to it, and the finely chopped parsley yields a pronounced green flavor without swamping the soup in foliage. In a small saucepan, bring the 2 cups of chicken stock to a bare simmer. In a measuring cup with a spout, combine the remaining 2 tablespoons chicken stock, egg, parsley, Parmigiano, semolina and a pinch of salt, whisking vigorously with a fork to break up any semolina lumps. Gently tip the egg mixture into the simmering broth, whisking the broth constantly. Whisk briskly for fine egg fibers, or more languidly for thicker ones. (If you prefer thinner soup, hold back a bit of the egg). The egg will set within moments. When it does, remove pan from heat immediately. Season to taste and serve piping hot. I mean no disrespect to my mom, who could be an outstanding cook. But she was also pragmatic and would never have bothered chopping vegetables for a single-serving soup when a can of broth plus an egg would do. 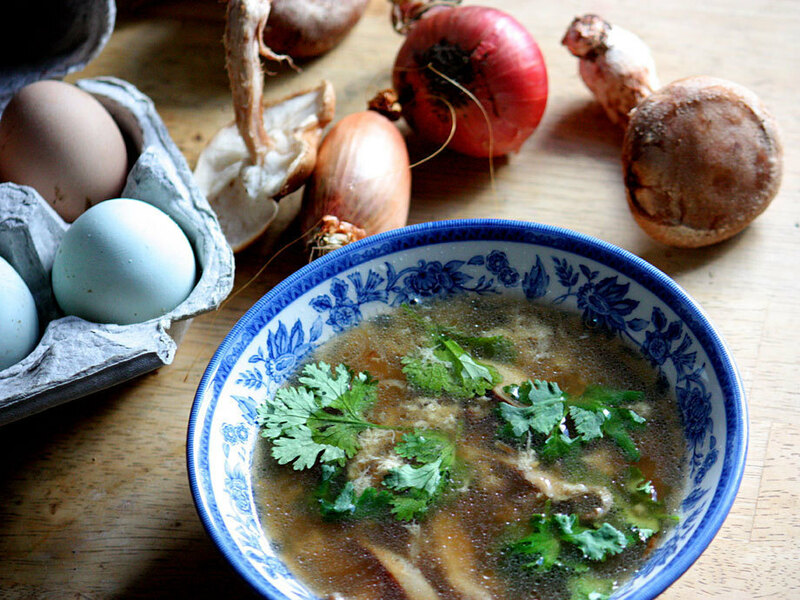 This egg drop soup is more Southeast Asian in flavor than the usual Chinese-restaurant soup. If you happen to have some spare wonton skins on hand, they make terrific, easy noodles that are invariably pleasing to little ones. In a small saucepan (just large enough to accommodate the whole single-serving soup), heat teaspoon oil until it just shimmers. Add sliced shallot and cook, gently, over medium heat, until it begins to caramelize in spots (4 or 5 minutes). Raise heat to high and add the remaining teaspoon of oil and sliced mushrooms. When mushrooms begin to sizzle a little, reduce heat and cover pan to help steam to tenderness, another few minutes. Meanwhile, whisk egg thoroughly with shaoxing and fish sauce. When mushrooms are tender, add chicken stock and bring to a bare simmer. If using wonton-skin noodles, add now. Gently tip the egg mixture into the simmering broth, whisking the broth constantly. Whisk briskly for fine egg fibers, or more languidly for thicker ones. Taste for seasoning and add a few drops of honey to taste. Garnish with chopped cilantro and scallions, if desired. Serve piping hot. This recipe is adapted from The Olive and The Caper (Workman 2004), a splendid Greek cookbook by Susanna Hoffmann. 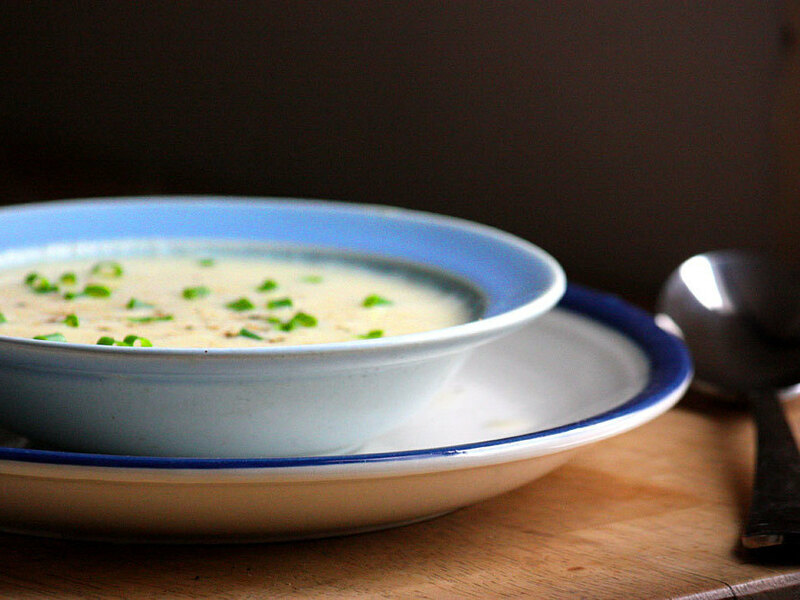 Avgolemono should be smooth, with no curdled egg threads, so don't reboil the soup once you've stirred in the egg. I like mine sprinkled with chopped chives, though it's perfectly good without. In a small nonreactive saucepan, bring stock and orzo to a simmer over high heat. Reduce heat and simmer until orzo is tender but not mushy, about 9 minutes. Taste and season with salt to taste. In a medium bowl, beat egg until frothy. Whisk in lemon juice, then slowly beat in a bit (about 1/2 cup) of hot stock, whisking vigorously. Remove saucepan from heat and whisk in egg and lemon mixture. Serve immediately, without reboiling, finished with black pepper and chive if desired.